I took my secateurs for a walk today. My intention was to harvest the hop vines on the stables and chop back the triffid-like tendrils of the passionfruit vine to let a little light in to ripen the last fruit, but I got sidetracked picking flowers instead. Though our wedding garden is now a bit of a shambles (the lawn’s still in fine shape but the cosmos is falling over on itself, I haven’t dead-headed the dahlias since February 18 and sparrows have stripped every seed from the sunflowers, leaving only hollow husks in varying states of decay), there are plenty of flowers to pick. 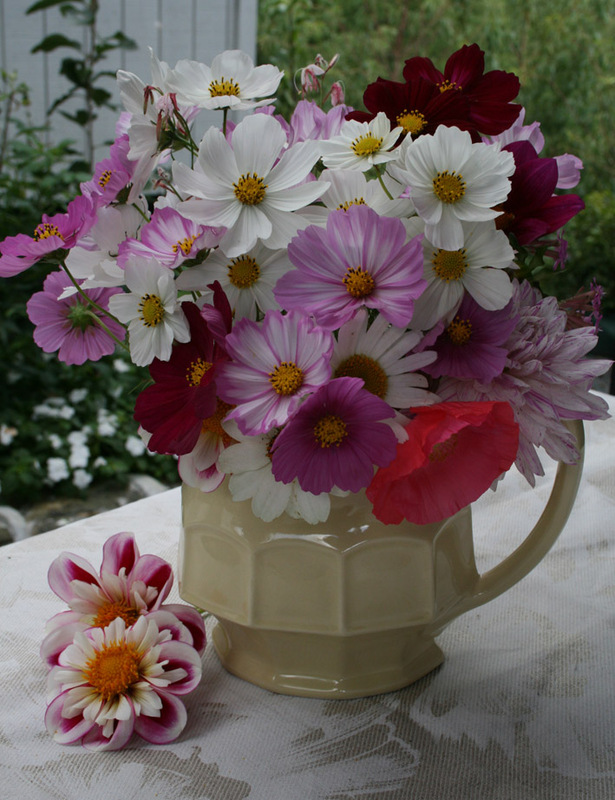 I’ve still got single-flowered dahlias, white, pink and burgundy cosmos, Shirley poppies, zinnias, coneflowers and shasta daisies in pastel shades, as well as orange cosmos, coppery coreopsis and red gaillardias in the wildflower border. Most only last a few days in a vase (or jug; I’m a compulsive jug collector), which doesn’t matter a toss because there’s plenty more where they came from. I’m going to go mad for flowers next spring and plant a proper “picking garden” on the terraced hill behind our house. It’s such an old-fashioned concept, a cut flower border, but I’m not sure why. After all, a vege patch is really just an edible picking garden. 1. Sedum ‘Autumn Joy’, for its rusty-red blooms at this time of the year. 2. Masses of Russell lupins. They’re a bit borderline in terms of the climate but I’ll give them a go anyway. 3. Honesty, for its papery seed pods. 4. Orlaya grandiflora ‘White Lace’. I just adore this plant; and was amazed that the delicate lacy flowers last for well over a week in the vase. 5. Love-in-a-mist. It’s probably hopeless for picking but it’s so pretty I don’t really mind. 6. White clary sage. I’d forgotten this gorgeous plant existed until I went to Southland in March and was given a glorious little tussie-mussie posy with it in it. Now I can’t wait to grow it again! 7. Fragrant sweet peas. I’m going to sow them along the farm fence and hope the cows don’t chew them. 8. Solomon’s seal. Another perennial I used to grow but haven’t in years. Mum was complaining to me tonight that her clump is getting out of control, so that’s easily fixed. I’ll take to it with a spade and steal all the extra bits for my garden. 9. Pink, purple and white echinacea. Plus the new Parva Plants catalogue arrived on my desk this week. I’m afraid to open it. I fear for my credit card. So many gorgeous perennials… and so little time to get them in the ground before I can no longer see over my belly to plant anything! Now I’m all inspired. Bring on Saturday – a whole weekend of gardening – hope its fine. I’m trying to limit my plant purchasing until spring (as it’s not like I’ll be planting much for a while)… but saffron… ooh. I tried to grow it in a pot a few years ago but eventually lost the bulbs to rot. How are yours coming along?